2018 Update: These low heel pumps have been around for years and years, in a zillion colors, and people still LOVE them, so we’re adding them to our Workwear Hall of Fame! You can find them at Nordstrom, Zappos, Neiman Marcus and others, including (as noted above), ShopBop. Admin Note: We’ve been having massive problems on the backend of the site today so you may or may not see that ugly “Checking your browser” message where you have to wait for 5 seconds before you can see the page — we’ll get it down as soon as possible. Thank you for your patience! DH and I are invited to a couples’ shower. The invitation does not mention a registry, only the couples’ honeymoon fund. What do we do in this situation? Gift money for both the shower and the wedding? Search for a registry anyway on common sites: pottery barn, bed bath and beyond, whatever would be typical for your area. I’ve found several that way. Ask the host if they have a registry! Since there is some gift info on the invitation, I suspect it may turn out they’re having a honeymoon-fund-shower, which imo is tacky. But you’re allowed to give gifts that aren’t on the registry, for both showers and registries, if you don’t want to just give money. +1. DH and I received a lot of gifts that were not on our registry. Some are cherished keepsakes or at least things that we really enjoy(ed) having, and some are not. The bottom line is that nobody is obligated to give from the registry or contribute to a honeymoon fund or give enough cash to cover their plate or anything of the sort. Sounds like a honeymoon fund shower– so tacky. I’d decline. Same. Something about friends charging admission to their party rubs me the wrong way. And I’d otherwise buy a really nice gift from their registry. But the cash grab – just yuck. Wait what? This is a thing? How… what… why…. Unfortunately, this is for DH’s very good friend and DH has accepted a role in the wedding, so I don’t think we can decline without good reason. Huh? We have a honeymoon fund and no physical gifts on our registry. I would definitely not have a shower in that circumstance. A shower for what? To make it rain those dollar bills! Sorry, I couldn’t help myself. They might just be having a shower to have a party and honor the occasion. My husband and I did not have a registry (or a honeymoon fund) but some friends and family threw me a shower anyway. I got a couple small gifts from family and that was it. I would not automatically view it as a money grab. I usually do not give separate gifts for showers and weddings. It’s become common to have 3-4 parties leading up to a wedding, and I just can’t buy a gift for an engagement party, shower, and bachelor*tte party in addition to a wedding gift. In this case, if there’s no registry, the couple is unlikely to be opening gifts at the shower, so I’d give a card at the shower and either buy a gift or write a check later as a wedding gift. Do them the favor of not attending the shower or the wedding. That way they can contribute the money they save to their honeymoon fund, you can spend your money and time in a way you actually want to, and everybody wins! A shower is hosted by someone else, the couple doesn’t save any money if you don’t attend. I asked this question on another post, but didn’t get responses, so thought I’d try again! Does anyone with wide feet have experience with the Vara or Varina? Do the wide width sizes fit true-to-size? I’d love some nice looking shoes to fit my wide feet, and these are certainly the nicest I’ve found. Agreed. Grandma Trudy has fat feet with corns, and she LOVES Ferragamo’s! Plus she is over 80 years old, so they give her special attention when she goes in with me! Go for it! I think they run true to size and are a bit narrow. They can probably customize anything. Nordstrom I think will ship them to you free returns. I find them a bit narrow. Instead I have Stuart Weitzman flats, called Capture. I love these shoes. 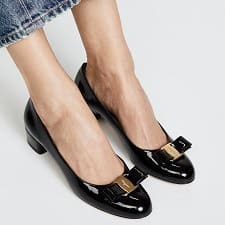 Ferragamos make me nostalgic for my late grandmother, who loved Ferragamos and had great style (and swagger) right up until she passed at 99. If I could afford to replace all my shoes with these, I would. No apologies for old lady style. They’re classic for a reason!! Weren’t these recently called “menopause heels”? I’m in that demographic so I suppose it’s time for me to buy a pair. I’ve never heard that and I think it’s ridiculous. Interesting—my grandma wore a lot of timeless/ageless stuff so I don’t really associate them with age…just her :). I think they’d look good on anyone! I like them, but have always been hesitant to wear them in my more male-dominated office. The bows just look a bit too twee and feminine to me…although to be fair, I also dress very menswear inspired during the week so it doesn’t really fit in. Could the feminine/twee note add a little bit of playful balance to the menswear-inspired look, though? Like a black suit with a sprightly bright scarf – an offset to the overall tone? I love these too! I never thought of them as old lady shoes. I think they’re classic and beautiful. Also, a lot easier to walk in than thinner heels. As a former mascot and student at Big Red I hope you get the role you want and am jealous that you get to work far above Cayuga’s waters. Just FYI, University of Nebraska is also a user of the “Big Red” moniker, so I’m not sure how much you can assume location based just on that. I’m attending a wedding in Normandy this summer for two dear friends (French and Swiss). Any thoughts on a good gift? I’ve only been to American weddings, but I imagine cash is always a good fallback. 100 EU? Something more tangible? TIA! An American Flag, Band of Brothers and Saving Private Ryan DVDs. Perhaps also some freedom fries? Champagne. Or something really lovely and delicious from your area. I’m going to say that a gift will mean so much more than cash! I look at our gifts and feel so thankful for our sweet friends. A few favorites – a plate w our wedding date and names from Etsy, wine glasses with “His” and “Hers”, and monogrammed towels (even though I kept my last name I love the thought). And please send a card. It will mean a lot to share your love for them. Seems like traveling that far and at such expense is a nice gift? It is, but I think you should still get a token physical gift if you can afford it. I think something cute from Etsy is a good suggestion or champagne/wine is always a good fallback. Tipping question re cleaning service. I recently signed up for a new cleaning service; it’s quite a bit more expensive than my last service and a bit of a stretch for my budget but I just have to make it work. I was happy with the first clean so they’ve assigned that same person to come out to my house. Do I need to tip this person? With the last service, I didn’t tip because I never knew who was coming or how many people would come. When I had an individual, I didn’t tip because she owned the business so she sets her rates and 100% of the money is going to her. But now that this service has assigned one person, is this more like a hotel where I need to tip every time she comes? I’ll tip her at the holidays just like I have with all the other services. Other people may do this different, but I tip every single time. The service I use has several people they will send, so sometimes it’s a person I’ve seen before and sometimes not, but I always give them a ~20% cash tip. Can you ask the service what typically happens/what employees prefer? Tip at the holidays. Just make sure you give it directly to your cleaner and not to the service. Yes you need to tip every time plus extra at the end of the year. I disagree. In my area no one tips at each cleaning. Just an annual Christmas bonus. Help!! Need advice dealing with a particularly annoying coworker. This woman is about 2 years older and levelled similarly in the organization but likes to behave like she is my supervisor or, at the very least an assigned mentor. Ignoring and avoiding her aren’t options because we are a small team and she sits at the desk next to mine. I would be very tempted to explode one of the bean bags in her workspace. How does anyone do any meaningful work (I’m sorry, *contribute*) in a bean bag. What exactly about a bean bag precludes meaningful work? I’m several inches too short for any of the seating in my office. I have definitely taken breaks from my desk (with its booster seat and foot stool accommodations) to go type on my laptop in a bean bag, and I’ve gotten plenty of work done. You sound like the sort of British colonist who docks a dog’s tail for the sole reason of encouraging him to “sit up straight” like a gentleman. If the workplace were too formal for bean bags, there wouldn’t be any bean bags there. She sounds annoying and self-centered, but I don’t think you’re going to be able to change much of her behavior and you should instead focus on managing your own reaction to it. Make sure your higher-ups are giving you credit for the work you do, and otherwise just stop letting this person get under your skin. Fixating on things like whether she prefers chairs or poufs is not a good use of your mental energy. It might be worth exploring if you can change your desk location. If not, give friendly, non-confrontational feedback about the stuff that is actually impacting your work (“Hey, can you take your call in the phone booth? I really need to focus on this document.”), and stop worrying about things that are just annoying (preferences, self-aggrandizing comments, etc). If that doesn’t work and you can’t officially move your desk, maybe you can find somewhere else to sit and work for a few hours when you’ve reached the “b*tch eating crackers” level of irritation with her. Good luck!